The “HydraFacial” treatment is the newest advance in non-laser skin resurfacing. Living in Colorado’s dry and ever changing climate causes the skin to undergo many seasonal changes. If you are looking for a younger, rejuvenated appearance, the non-invasive HydraFacial™ resurfacing procedure at Xanadu Med Spa may be the perfect solution. 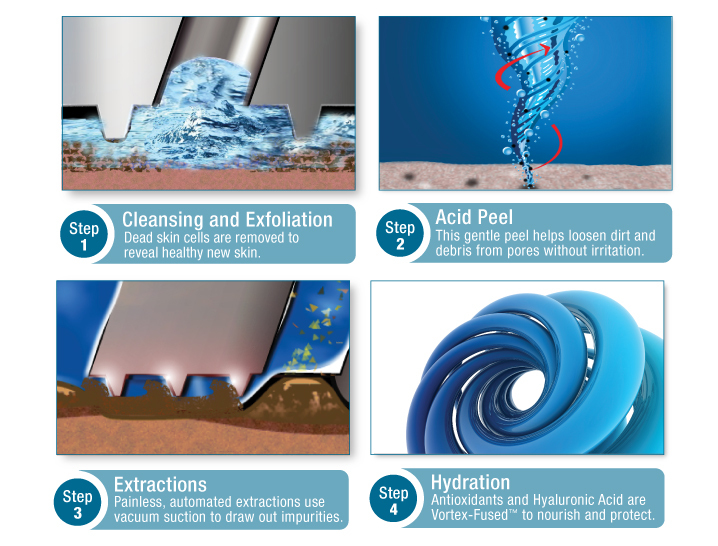 The groundbreaking HydraFacial™ procedure – designed for all skin types – safely, effectively and instantly achieves unparalleled results, including a reduction in the appearance of naso-labial folds, sun damage, hyperpigmentation, fine lines and wrinkles, oily skin, blackheads and whiteheads, enlarged pores, acne, brown spots, and much more. HydraFacial™ is the only hydradermabrasion procedure that combines cleansing, exfoliation, extraction, hydration and antioxidant protection simultaneously, resulting in clearer, more beautiful skin with no discomfort or downtime. Unlike many other skin resurfacing procedures, the quick and painless HydraFacial™ resurfacing procedure is capable of eliminating dead skin cells and extracting unwanted impurities while simultaneously hydrating the skin with rejuvenating, antioxidant-rich moisturizing serums. This unique hydrating approach achieves an evenly balanced, refreshed and younger-looking appearance, and best of all, it’s soothing, immediately effective and requires no downtime whatsoever. If you are looking for medical-grade facial rejuvenation in Fort Collins, consider HydraFacial™ from Xanadu Med Spa. With the incredibly fast HydraFacial™ treatment, you can look forward to seeing immediate results in as little as 15 minutes. The HydraFacial™ doesn’t require any downtime, so you’re free to apply makeup and return to your normal, routine activities immediately after the treatment. While most patients report seeing the visible results they desire after just one session, these results and the overall hydration typically only last around five to seven days, sometimes longer. With that in mind, our experienced professionals recommend undergoing one treatment per month in order to achieve and maintain the best results possible. WHAT ARE THE KEY BENEFITS OF HYDRAFACIAL™? The HydraFacial takes approximately 45-50 minutes. A single treatment is perfect for those who need a fresh and glowing appearance for a special event or occasion. For those wanting to maintain healthy skin and a vibrant look then monthly treatments would be recommended. Schedule your free consultation from Xanadu today!